1) Born in Kingston, New York in 1939 & raised in Manhattan. 5) His parents didn’t get a television until he moved out of the house. 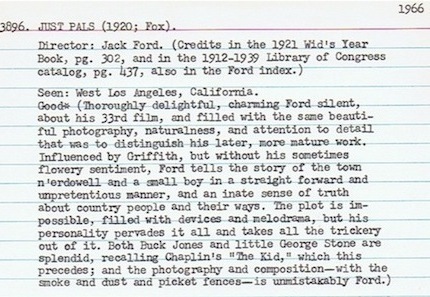 11) At 24, he did a retrospect on Orson Welles at the Museum of Modern Art in New York for $50. 12) Started writing freelance articles on film for Esquire magazine. 13) Had his second theatrical flop in New York and moved to LA with his wife Polly Platt to try to get into the movies. 16) Bogdanovich also found most of the locations and shot second unit on The Wild Angels. And suggested Peter Fonda for the lead. 17) Just before turning 30 he directed and co-wrote a feature film for Corman called Targets starring Boris Karloff. 18) His next film was The Last Picture Show (1971) which he directed, edited and co-wrote. It was nominated for 8 Academy Awards and comparisons were made between a young Bogdanovich and Orson Welles after he made Citizen Kane. That’s a good place to stop for now. Professionally, that was Bogdanovich’s mountain top experience. He was 32 years-old. We’ll look where his career went from there in a later post. But look at the journey. It’s not something that you can duplicate as a filmmaker. But you can appreciate the work and the years (even the failures) that led up to his breakout success. It’s another prime example of the 10,000 hour rule in effect. What you can take away from Bogdanovich is he took small steps and moved forward. He was serious about the craft. From his film index card system that he started when he was 12, to working at a regional theater in Michigan as a teenager, to hanging out with New York film critics in his early 20s, directing off-broadway plays, writing articles, jumping into Roger Corman’s B-film world, to writing and directing The Last Picture Show was basically a 20 year journey. P.S. Here’s a little bit of odd film trivia I just discovered. Bogdanovich’s first wife, Polly Platt (who had her own distinguished career in Hollywood) was born in Fort Sheridan, Illinois—the same city where actor/writer Sam Shepard was born. And just 4 years apart. Fort Sheridan is a Chicago suburb on the North Shore of Lake Michigan and just 30 miles from where Orson Welles was born in Kenosha, Wisconsin.